We’ve seen lots of maps of the US recently, mostly reflecting political divides. Some are accurate, others...less so. But in the same way that maps can inform, they can also blind us to features of our society. Most maps of the US focus on political boundaries - borders defined by legal negotiations which define the limits of subnational authority. But people’s lives don’t always fit neatly within those boundaries. Maybe you cross a city, or county, or state border to get to work. Maybe you cross those borders for school, or to worship. Maybe you just like to cross borders for fun. The map above is what happens when a computer decides how to draw borders and ignores political boundaries. 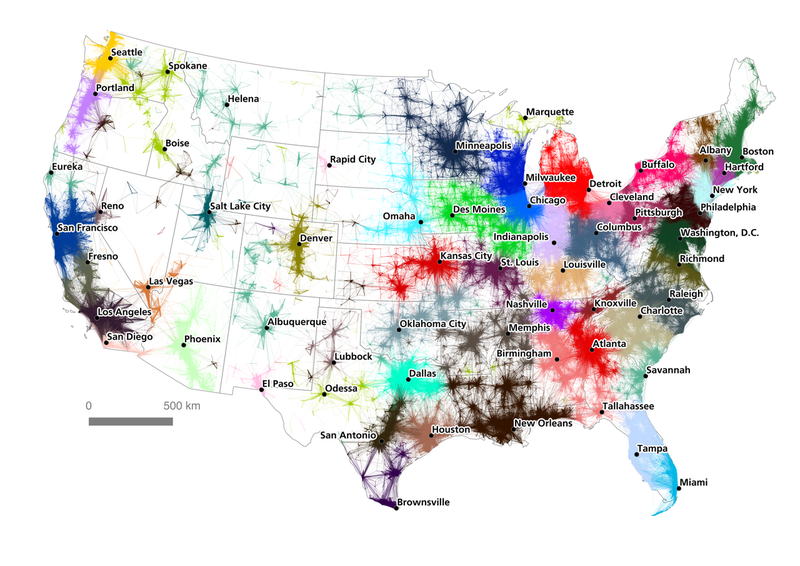 Those lines (vectors) are commuter flows, one way of measuring the economic geography of the United States. Rather than think of space as what is contained by legal boundaries, we can think of the space as divided into economic enclaves. The researchers who created these maps simply asked the computer to look at a large dataset of economic connections and draw a new set of borders around economic regions. I like the top map more (because it’s colorful and shows connections), but the bottom tells a really powerful economic geography story, and that’s pretty neat, too.